Is this the moment Harry had to hide that he was trying for a baby? 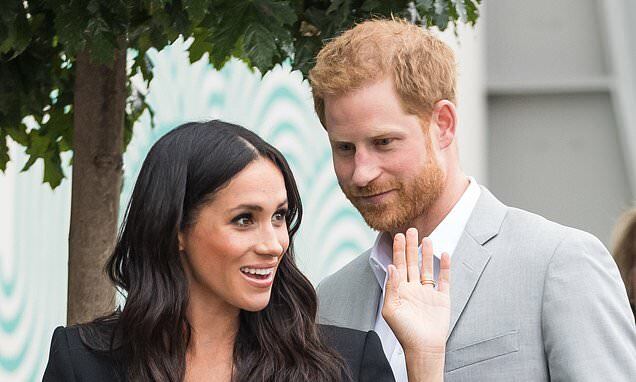 Prince Harry was asked if he and Meghan were trying for a baby close to when the child was conceived, MailOnline can reveal today. The Duchess of Sussex is believed to have become pregnant around ten weeks after they married at Windsor Castle in May and just after their trip to Ireland in July. Meghan is believed to have had her 12-week scan last week, meaning the couple went on a two-day visit across the Irish Sea around the time they were trying for a baby. In one extraordinary exchange in Dublin, Harry was asked about it directly as he met people in the city. One woman was heard asking him: 'My husband also has red hair and he gave me five children - when are you and Meghan going to get going?' - Harry laughed and replied: 'Five children? Too many'. Later that day Meghan seen sipping Champagne at a black tie party in the Irish capital, suggesting she was not pregnant at the time. Today the couple announced they are expecting their first child and Meghan is believed to be approaching 13 weeks and 'in good health'. This means the baby was conceived around July 20 - just ten weeks after they walked down the aisle. And the child is due in late April 2019, possibly around St George's Day, April 23, meaning the child could share a birthday with his cousin Prince Louis. The pair are also known for their warm, caring approach when meeting youngsters on official visits.